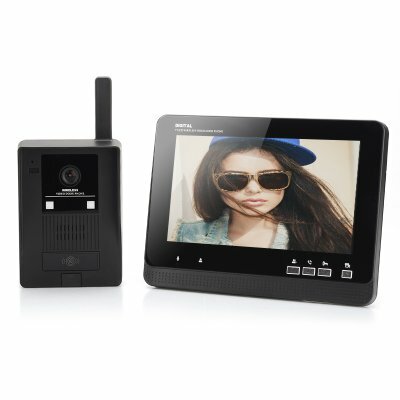 Successfully Added Wireless Video Door Phone - 7 Inch LCD Monitor, Auto Record Function, 1/3 Inch CMOS Camera, 300 Meters Range to your Shopping Cart. DP900 Wireless Video Door Phone with 1/3 inch omn vision CMOS camera and 7 inch LCD monitor for home and office security. The DP900 Video Door Phone uses a 1/3 inch Omn Vision CMOS 380TVL camera that works via a 2.4 GHz frequency so can be mounted outside with ease. This camera can relay all video feed to the 7 inch LCD monitor that displays at 800x480 resolutions and as the camera has 3 meters of night vision that works in 0Lux you can see who’s at the door night or day. It even has a protective rain shield to keep it protected and provide a clear view in inclement weather. The LCD monitors can receive information from the camera unit from up to 300 meters away so no matter where you are in the house you can take it with you. With a micro SD card slot that supports up to 32GB cards you can use the video recording feature to keep a record of whomever comes to your door and for extra safety the device will automatically record when someone buzzes the door transmitter. With this door intercom and video unit you needn’t rush to the door again as with when used with electronic locks you can even remotely provide access from the monitor and control unit. This state of the art fully digital system has robust anti-interference so the 2.4GHz communications are secure against interferences. Take command of your home security from any room as this video door security system put the power back in your hands. This product is in stock now, we guarantee next working day shipping and offer a 12 months warranty on all our products. Brought to you by the leader in electronic devices and wholesale video door security systems, Chinavasion. 2.4GHz launch frequency, 300 meters barrier free remote control distance, robust anti-interference.